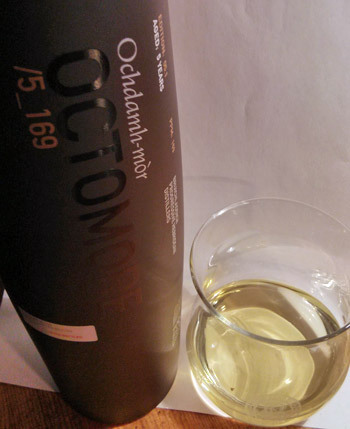 This is the Bruichladdich Octomore 05.1, 169 PPM, aged 5 years. It's a limited edition of 18000 bottles. Mine has the mildly interesting number 13131. Not that it matters, but I thought I share this useless fact anyway. Ryan Campbell went on a Lovely Christmas "Eve"ning walk in Port Ellen. Andrew of The Bowmore House wishes us a Happy Christmas from the Bowmore House. Mark Reynier reports the weather from I think his home, Christmas Eve, Islay. No snow, 9C, 7knts. Bit of a blow forecast though. And that's all I have for today. Merry Christmas! PS: Just chatted with my sister in Germany for almost 3 hours. Got to love t'internet and free VoIP telephony.